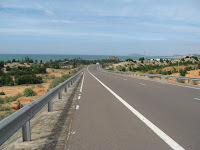 Mui Ne is a small village that has became a sea resort, but the reason I came here was not the beach, but the sand dunes nearby. 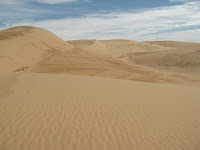 I rented a motorcycle and went first to the white sand dunes, which are about 40 km away. It look a little bit of Sahara, I guess (until I make it to the real dessert, this will do it). It rained hard the night before, and this made the color of sand a light brown rather than white; also, it was easier to climb it. 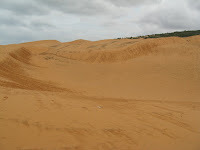 The red sand dunes are a lot closer to the vilage, and cover a smaller surface, but nevertheless they make an interesting scenery. 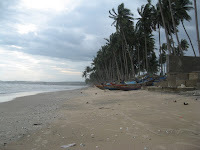 The beach of Mui Ne strech on few kilometers, and plenty of coconuts are around. A small fishing village is there and there are tens of boats on the beach.